Discovery of deoxyribonucleic acid (DNA) solved out the mystery of cellular functioning and abnormality in cellular metabolism. Understanding the coding of DNA resulted in enormous medical growth and helps the researchers in finding the genes which trigger major chronic diseases in humans. Further, the structural and sequential analysis brought humans into a new era of medical industry. The advancement in understanding of DNA could be a boon for agricultural sector as it allowed the farmers/breeders to choose better varieties with disease resistant features. In developing nations where the staple foods suffers with micronutrient deficiencies and stress conditions, DNA modifications and repair mechanism could solve out their problems. The role of DNA damaging factors and repair mechanism plays a crucial role in occurrence of certain disorders. Extracts prepared from various natural resources could either stop or slow down the process of DNA damage. This will help to eradicate major disorders related to DNA from human race. Further on the basis of type and dose of natural extracts, it would ease the planning of diets for patients suffering from chronic disorders. Being a complex macromolecule, deoxyribonucleic acid (DNA) controls the important genetic characteristics of living organism. Genes are important segment/sections of DNA that are indirectly involved in coding of proteins which acts as a basic building for cellular system (Singh and Sharma 2018). The majority of genetic information, defects and diseases rely on types of DNA, their structure and functions performed by them within the human body. The effect of several factors (environmental, synthetic chemicals, UV rays, genetic defects) on DNA modulates its functionality within cells and ultimately results in notable changes in the living organisms (Farag and Alagawany 2018). Damage to DNA and its important segments could occur at endogenous level as well as external factors, thereby posing a threat at cellular level (John 1987; Lu et al. 2015). Continuous exposure of DNA and genome of living organisms to damaging factors could result in variety of genetic defects which might be inherited from one generation to the other (Perez-Coyotl et al. 2017; Han et al. 2017). Understanding the molecular structure and functionality of DNA could help scientists to discover new drugs for the treatment of various chronic diseases. In fact, discovery of important genes that are required to sustain normal metabolism in the cells and their subsequent analysis for therapeutic purposes influenced scientific community (Gagna and Lambert 2006). Artificial methods are being employed to change sequences of DNA to achieve desired results in diseased patients and genetic improvement in agricultural sector. DNA is an important molecule to be studied for the welfare of human race (Liu 2017; Sawitzke et al. 2017). Modifications at genetic level could result in drought as well as salt-tolerant crops with maximal yield. DNA modifications are not restricted up to plants system even it could be used for the improvement of animal breeds also. Researchers all over the world are working on the aspect of relating the changes in DNA with evolutionary development (Hefferon 2018; Ma et al. 2017; Hall 2012; Deichmann 2011). Being a complex molecule, DNA has its presence in every cells of body and will help to sustain growth and repair during various metabolic reactions (Turgeon et al. 2018; Shimizu et al. 2014). 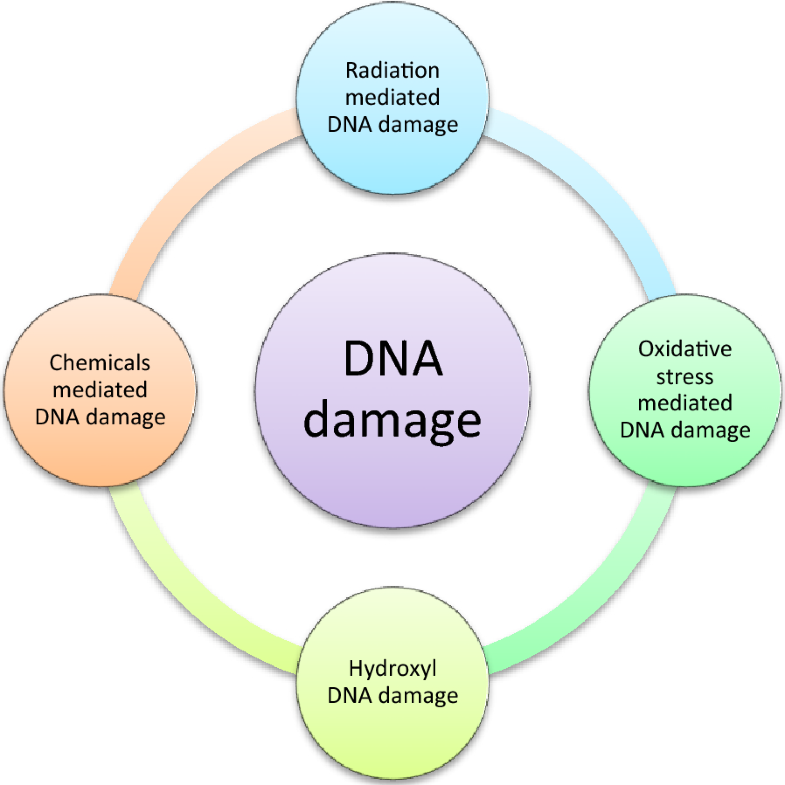 The present review covers types of DNA damage (Fig. 1), its importance for living organisms and role of bioactive compounds in preventing DNA damage. This review may help readers to understand the importance of natural resources and their use as a remedy for various disease treatments. Radiations are being used in the treatment of various diseases and for the welfare of human beings. However, like other scientific discoveries radiations also have some deteriorating effects of living organism (Little 2003). Scientific reports since long time accepted that exposure of living beings to radiations could result in cellular death, DNA damage and early aging problems (Desouky et al. 2015). Everyday living organisms including humans are exposed to radiations; however, the amount of radiations they may face vary as per location, intensity and timing. Deteriorating effects of radiations are dose dependent and characterized by specific threshold value (Tubiana et al. 2007). However, in response to radiations the body of organisms starts cellular defense mechanism: (1) production of antioxidants, (2) activation of detoxifying enzymes (dismutase and catalase), and (3) elimination of old and dead cells via apoptosis phenomenon. Sustainability in biochemical reactions is controlled by specific molecules and enzymatic pathways. Molecular structures may rely on type of specific bonds varying from cells to cells and types of ongoing processes within cells. Slight alteration in chemical bonds may result in observable changes in the pathways and structural components. Radiations act as powerful factors that can affect the living organisms even at DNA level. Dependency of cellular system on radiation dose could result in major changes in the body of living organisms (Scott 2008; Waldren 2004; Joiner et al. 2001; Shadley 1994; Wolff 1992). The radiations affect the living system in two ways: (1) functional death of cells and (2) reproductive failure of cells. Functional death of cells may lead to abnormality in cellular functions due to internal changes in cells. However, in the reproductive failure case, the cells may perform their daily routine functions but despite their performance they are not able to reproduce. Experimental trials are being carried on animals by researchers/scientists for the verification of radiation effects. However, the degree of damage may vary from organism to organisms depending on the type selected for experimental purpose. Experimental data collected from animal studies greatly vary while estimating the genetic risks in humans. Communication mechanism plays an important role during cellular exposure to radiations (Nikjoo and Khvostunov 2004). Adverse effects of radiations are tissues specific even within the single organism. The type of harmful effects may vary from instant response to delayed response depending on the type of tissues, age of organism, exposure time and immune system of exposed organisms. The majority of DNA damage occurs in human beings in response to oxidative stress (OS). Human DNA remains continuously in exposure to free radicals attack. Several factors are responsible for the formation of reactive oxygen species (ROS) and free radicals (FRs). The major factors include: change in life style, restless life, types of dietary elements, fried foods/junk foods and smoking (Kaur et al. 2018a, b; Salar and Purewal 2017; Salar et al. 2017a; Chandrasekara and Shahidi 2012). These factors contribute towards imbalance in the formation of FRs and antioxidants within human body (Dhull et al. 2016). The formation of ROS and FRs is a continuous phenomenon that occurs during normal respiration process. These byproducts are accepted as sole factors for OS-mediated injuries in living organisms (Georgakilas et al. 2010; Xiao et al. 2015; Salar et al. 2017b). The formation of bioactive antioxidants within living organisms in response to ROS and FRs is one of the defense mechanisms. Biomarkers played an important role in the assessment of OS, ROS and FRs. The major biomarkers comprise FRs product and ROS in response to certain specific substrate and factors. Analysis of damage using markers creates a bridge between the occurrence of DNA damage and solution to chronic diseases. As the measurement aspects of markers help to determine the adequate amount of specific nutrients to be supplemented in daily routine diets (Bloomer and Fisher-Wellman 2008). The frequency of cellular DNA damage in humans depends on the type and quantity of bioactive constituent's production in response to FRs. Uncontrolled tumor growth increases in response to higher amount of ROS and FRs. Cellular mechanism in those conditions starts releasing cytokines which help in cell signaling during damage/cellular injury (Mantovani et al. 2008). Damage to DNA could occur in two ways: (1) Exogenous and (2) Endogenous (Kryston et al. 2011). Exogenous DNA damage occurs in response to certain specific environmental factors such as X-rays, cosmic rays, UV radiations and secondary pollutants from chemical oxidations (Parplys et al. 2012; Salar et al. 2016). Endogenous DNA damage occurs in response to intracellular cellular disturbance in signaling and various metabolic pathways required to sustain healthy life style (Cadet et al. 2010; Sedelnikova et al. 2010). Several scientific reports suggest that chronic oxidative stress (COS) conditions are strongly associated with carcinogenesis (Hwang and Bowen 2007). Generation of ROS and OS conditions results in modification of DNA bases which leads to abnormality (mutations, translocations, gene inactivation) at genomic level (Toyokuni 2006). Hydroxyl radicals are responsible for DNA damage via their contribution in ROS and endogenous oxidation (Cadet et al. 1999). During the normal respiration process, superoxide radicals are formed as a side product and contribute to OS conditions. Exposure of cellular system to chemical agents, free radicals and radiations brings carcinogenesis in them which further result in disruption of important biochemical reactions in living organisms. Metabolism of oxygen with in living organisms generates OH−, O2− and H2O2 which reacts with the biological macromolecules such as DNA, lipids and proteins causing modification in biochemical pathways. Scientific reports confirmed the formation of tandem lesions in response to OS conditions (Box et al. 1997; Delatour et al. 1998; Cadet et al. 1999). Hydroxyl-mediated DNA damage starts with modification in purine and pyramidine bases along with strand breaks and cross links at various sites. Experimental works are under process to reveal the changes at the level of deoxyribose and sugar hydrogens of DNA duplex. Various complexes formed during the hydroxyl-induced damage prefer to react with specific deoxyribose hydrogen atom and result in abstraction of deoxyribose hydrogens (Hangeland et al. 1992; Kozarich et al. 1989; Sitlani et al. 1992; Balasubramanian et al. 1998). Chemical agents act as a powerful mutagen which could damage a significant amount of DNA (Auerbach 1976). All the chemical agents are not able to cause DNA damage with in living organisms. However, they are present in inactivated form and need an impulsive response for their activation. During the combustion of non-renewable as well as renewable resources like coal, gas tobacco and gases, some secondary pollutants may form which cause damage to DNA (Noah et al. 2019; Smit et al. 2019; Aucella et al. 2019; Guilbert et al. 2019). Smoking is solely a man-made DNA damaging exogenous process which is more dangerous and plays an important role during tumor formation and induction of lung cancers (Rojewski et al. 2018; Kaufman et al. 2018; Christensen et al. 2018; Donner et al. 2018). In addition to manmade chemicals, certain microorganisms and plant products are also responsible for DNA damage in organisms. Fungal strains produce certain metabolites under harsher conditions or in response to specific media components which contribute to cause certain cancers in humans. The metabolites termed as aflatoxins, especially AFT-B1 produced by Aspergillus spp., acts as hepatocarcinogen which results in abnormality and cirrhosis in liver (Feng et al. 2017; Manova and Gruszka 2015; Hamid et al. 2013; Asim et al. 2011; Barrett 2005; Verma 2004; Jackson and Groopman 1999). A reactive epoxide may form in response to AFT-B1 which reacts at specific position (N7) of guanine and cause metabolic disfunctioning of liver. Certain plants secretes secondary compounds in response to stress conditions which are also cancer inducing. Among carcinogens (limonen, aristolochia acid, arecolin and reserpin) of plant origin, safrol is an important compound to be studied in detail as it found in pepper, celery, and Sassafras albidum which cause cancer. Excess formation of free radicals/oxidative stress results in injury to important biomolecules in living organisms (Zhao, 2005; Kaur et al. 2018a, b; Singh et al. 2018a, b). Free radical/oxidative stress creates damaging conditions via different ways and it includes: oxidation of proteins; non-recoverable damage to plasma membrane; and DNA damage. Oxidative stress harbors normal metabolic reactions of brain and relative tissues. Measurable changes at DNA level lead to occurrence of diseases like Alzheimer disease; Parkinson’s disease, early aging and diabetic conditions (Zhao 2005; Butterfield and Kanski 2001; Smith et al. 1996, 1998; Kaur et al. 2018a, b; Singh et al. 2018a, b). Scientific reports suggest that there is relationship between onset of diabetic symptoms and oxidative stress. Free radicals/reactive oxygen species have unique capability to bind with lipids, proteins and DNA and there binding results in progression of late diabetic complication (Ayepola et al. 2014). Various in vivo studies carried out by researchers support the role of hyperglycemia in the generation of oxidative stress which further results in endothelial dysfunction in blood vessels of diabetic patients (Ullah et al. 2016; Ceriello 2006). Sharp increase in blood glucose and dyslipidemia in diabetic patients results in formation of macroangiopathies that cause atherosclerosis (Giugliano et al. 1995). Healthy diet rich in minerals, antioxidants and other important nutrients may slow down the rate of pathogenesis. Micronutrients played an important role in sustaining various metabolic reactions within the body (Li et al. 2014; Dhull et al. 2016). Vitamins B6, B12 and folic acid are reported to play a role in metabolism of homocysteine. Increased level of homocysteine than normal in the plasma of patients with AD has been reported (Dudkowiak et al. 2016; Malaguarnera et al. 2004). Blockage in major blood circulating pathway leads to sudden stroke and death of major population throughout the world. Change in blood composition and DNA damage is the major leading factor that causes death. The formation of free radicals/reactive oxygen species results in long-term disability in peoples of every age. Oxidative stress could cause disturbance in mitochondrial chain, ischemia-activated xanthine/hypoxanthine oxidase and imbalance in fatty acid metabolism (Taleb et al. 2018; Johnson et al. 2018; Sagoo and Gnudi 2018; Li et al. 2018; Lin et al. 2018). With increase in the activity of free radicals during oxidative destruction and nonreplicating nature of the neuronal cells, the brain is much susceptible to the damage caused (Traystman et al. 1991). Researchers explore the effects of bioactive constituents and their antioxidant properties on preventing the neural disorders, early aging and other chronic disorders. During Alzheimer’s disease, amyloid ß (Aß) and tau proteins play an important role in pathogenesis (Ittner and Götz 2011). Accumulation of Aß in the hippocampal region imparts toxic effects and immune response that lead to cognitive impairment (Anantharaman et al. 2006). The collection of Aß in the brain causes the dysfunction of mitochondria and metabolic disturbances as well as increased formation of the ROS (Sheng et al. 2012). The meta-analysis has shown significantly lower plasma levels of folate and vitamins A, B12, C and E in a group of AD patients as compared to control population (Dudkowiak et al. 2016). There is a strong belief that vitamin A, vitamin C and vitamin E which are antioxidants may be beneficial in slowing the progression and preventing AD (Dudkowiak et al. 2016; Di Domenico et al. 2015; Morris 2009). Diets enriched with natural constituents offer protection against the development of cardiovascular diseases (CVD), diabetes and cancer (Brevik et al. 2011; Jenkins et al. 2003; Ness and Powles 1997). Loss in functionality of macromolecules is a result of accumulation of oxidative stress and ROS which ultimately result in occurrence of diabetes, inflammation, Parkinson’s and Alzheimer’s diseases, and cancer (Salar et al. 2012; Benz and Yau 2008). Decline in mitochondrial efficacy with increasing age would result in release of maximal reactive oxygen which harbors DNA repair mechanism (Gedik et al. 2005; Fraga et al. 1990; Kaneko et al. 1996; Izzotti et al. 1999). Natural resources with antioxidant properties have played a significant role in providing the better health to human race. Natural resources (fruit, vegetables, cereal grains and medicinal plants) are considered as a rich source of bioactive components (vitamins, antioxidants, anthocyanins, sterols and minerals) (Neri-Numa et al. 2018). Because of natural antioxidants, fruits and vegetable act as a complementary and an alternative medicinal therapeutic modality (Singh et al. 2018a, b; Brevik et al. 2011). Bioactive components possess antiproliferative, antimicrobial, antioxidant, hypoglycemic and DNA damage protection activities (Kaur et al. 2018a, b; Salar and Purewal 2017; Nile and Park 2014). Bitter component (Naringenin) present in citrus fruits has shown promising results in the treatment of metabolic disorders (Alam et al. 2014) and its anti-cancer (Krishnakumar et al. 2011) and chemo-sensitizing properties are also reported (Bao et al. 2016; Abaza et al. 2015; Ahamad et al. 2014). Naringenin inhibited azoxymethane-induced colon carcinogenesis and protected plasmid DNA from UVB-induced DNA damage (Kootstra 1994). Antioxidant-rich natural resources are grown all over the world for their health benefiting secondary metabolites and functional products (Salar et al. 2017a; Dhull et al. 2016; Mikulic-Petkovsed et al. 2012; Szajdek and Borowska 2008). Multifunctional bioactive components present in natural resources are solvent specific (Liyana-Pathirana and Shahidi 2005; Cheok et al. 2012) and sensitive for extraction parameters (extraction phase, temperature and time) (Arruda et al. 2017; Salar et al. 2016). Bioactive components include: phenolic compounds, flavonoids, tannins and other important phytochemicals (saponins, catechol tannin, anthocyanin, steroids and sugars) (Salar et al. 2015; Salar and Purewal 2016; Siroha et al. 2016). Quercetin is an important bioactive constituent with antioxidant properties which has shown many health benefits including cancer prevention and treatment (Chirumbolo 2013; Russo et al. 2012; Bischo 2008). Scientific reports suggest that quercetin can interact with human telomerase sequences and stabilizes the G-quadruplex structure (Tawani and Kumar 2015). DNA duplex may form during the binding of flavonoids with DNA which protect DNA from the oxidative damage (Tiwari and Mishra 2017; Kanakis et al. 2006). Quercetin can affect the rate of formation of ROS, thus reducing the number of lesions in PC12 neuronal cells (Silva et al. 2008). Quercetin has capability enough to arrest cell cycle at specific points resulting in induction of mitochondrial pathway of apoptosis (Srivastava et al. 2016). Factors affecting the recoverable amount of bioactive components from natural resources need optimization. Response surface methodology is one of the important software that are being used by researchers/scientists for optimization purpose (Gilhotra et al. 2018; Singh et al. 2018a, b; Aggarwal et al. 2017; Singh et al. 2017; Bhatia et al. 2016). Natural resources with potent antioxidants and bioactive constituents should be analyzed in an array of model systems. The efficacy of bioactive constituents depends on soil profile, moisture content, stress conditions and nutrient absorption rate by the natural resources under a given set of conditions. However, suitable analytical protocols need to be adopted to monitor the kinetics of antioxidants during OS conditions. Extracts prepared from specific natural resources are currently being used against Fenton’s reagent for the protection of DNA from oxidative damage (Table 1). Considering the medicinal properties and broad spectrum applications present in natural resources for the welfare of human race, it is most important to identify the regulatory components/mechanisms involved in the whole process. The detailed knowledge of phytoconstituents helps plant breeder to screen out the best cultivars on the basis of specific properties they possess. Moreover, the relationship between the diet, stress conditions and DNA repair is of utmost importance. Stability of genomic DNA is maintained by the plants mainly in three counterparts: (1) chloroplast, (2) mitochondria and (3) nuclei. Several scientific reports suggest that during the evolutionary changes the simplified organelles build up symbiotic relationships with eukaryotic ones. Experimental studies are being carried out on various resources to identify the relationship among organelles, DNA damaging factors and repair systems. Significant DNA damage protection activity in extracts such as [Barley (Salar et al. 2017a); pearl millet (Salar et al. 2017b); Mung beans (Xiao et al. 2015); Grape seeds (Aybastier et al. 2018); Ashtvarga (Giri et al. 2017); Amazon moss (Fernandes et al. 2018); Sugarcane (Abbas et al. 2014); Eulophia nuda Lindl. (Kumar et al. 2013); Honey (Habib et al. 2014); Carissa carandas leaves (Verma et al. 2015); Bael flower (Chandrasekara et al. 2018); Teucrium polium and Stachys iberica (Tepe et al. 2011); Sphallerocarpus gracilis seeds (Gao et al. 2014); Garcinia gracilis leaves (Supasuteekul et al. 2016) was reported. Protocol for the preparation of extracts for DNA damage protection activity is summarized in Fig. 2. DNA damage resulted in breakdown of one of the phosphodiester chains in response to Fenton’s reagent during agarose gel electrophoresis. In response to hydroxyl radicals, the supercoiled form of DNA changes into a relaxed form. Fenton’s reagent-mediated reaction complex leads to the formation of hydroxyl radical in the presence of hydrogen peroxide (H2O2) and Fe3+. Breakdown of DNA strand may cause chronic diseases and age-related medical issues (Guleria et al. 2017; Gao et al. 2014). Antioxidants enriched natural resources have efficiency to protect DNA from damaging effects of radiations as well as Fenton’s reagent. Bioactive constituents and their derivative are directly/indirectly involved in slowing down the effect of carcinogenic agents. Effective exercise, natural extracts, balanced diet and daily routine activities which involve less stress could be a remedy for DNA damage protection. Further studies are required to elaborate the deep mechanism involved in DNA repair pathways. 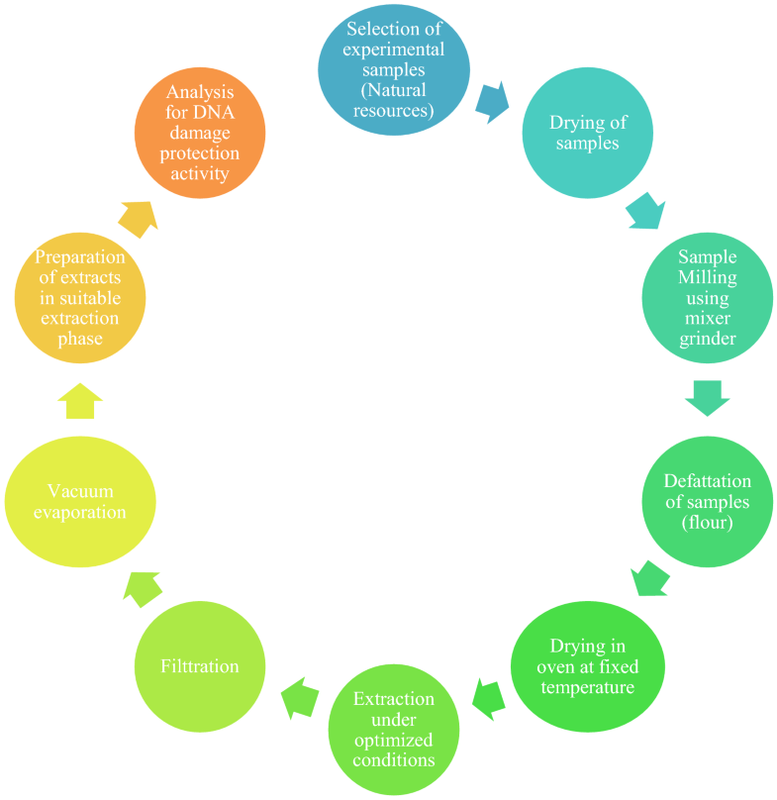 Toxicity analysis is necessary before the use of purified compounds in therapeutic purposes. The authors (PK, SSP, KSS and MK) prepared the framework, proofread, corrected and approved the manuscript. All authors read and approved the final manuscript. The support provided by Department of Food Science & Technology and Department of Biotechnology, Chaudhary Devi Lal University, Sirsa, India is gratefully acknowledged.